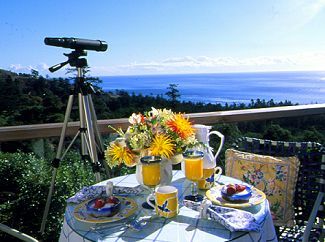 Nestled on a wooded hillside on the desirable West side of the island with views from the 88 foot veranda of Victoria BC, the Olympic Mountains, and overlooking the Orca Whale playground, the inn offers privacy, luxury, and peaceful atmosphere. Just two guest suites, both with wood burning fireplace, sofa, easy chair, TV/VCR, CD player, private phone line, king bed, window seat table and chairs, private bath, jet tub for two, steam bath shower, and refrigerator. Full breakfast served in your suite, or the inn dining room 8 to 10 AM. Afternoon tea and Mrs. King's cookies on arrival, or after a day of exploring the island. "Inn of the Month" by Travel and Leisure magazine September 2000 issue. Soon to be featured in Coastal Living magazine. Guests call it the "Four Seasons of the San Jaun Islands". It's a destination, not just a stop along the way! This and other Friday Harbor Bed and Breakfast Inns can be found here in The Register.